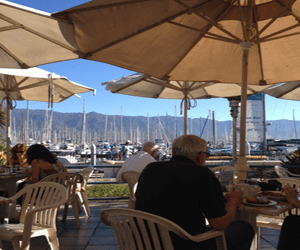 Welcome to the Santa Barbara Harbor Info page! The Harbor has a long and colorful history. It’s a beautiful destination for visitors and locals alike to enjoy all year round. The Santa Barbara Harbor runs parallel to palm-tree-lined Cabrillo Boulevard. It’s bordered by Stearns Wharf and the cliffs of The Mesa and is home to West Beach, Ledbetter Beach, numerous shops and restaurants, and the Santa Barbara Yacht Club. It’s a working harbor containing over 1,100 commercial fishing boats, pleasure yachts of all sizes/vintages and our 70 year old business, Chandlery Yacht Sales. 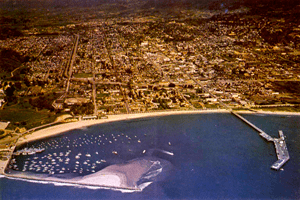 In 1873 the citizens of Santa Barbara began talking about building a harbor. Early studies by the US Army Corp of Engineers were unfavorable due to the potential disturbance of coastal sand flow. However, by 1926 the necessary funds were raised to build Santa Barbara’s first breakwater thanks to Max Fleischmann, who offered the City of Santa Barbara $200,000 for the construction of a harbor if the city would match the amount. (We know now that Mr. Fleischmann wanted a safe-haven for his 214’ yacht, “Haida.”) The first detached breakwater was finished in 1928, and an extension completed in 1930. The Santa Barbara Harbor, although thriving and beautiful, has suffered its share of damage from major storms occurring in 1963, 1973, 1978, and 1983. The 1983 storm was infamously heralded the “100-year storm” and caused sand to fill the channel, closing the harbor for six weeks. The harbor is now routinely “dredged” to prevent the flow of sand from blocking the harbor entrance. Visit the Santa Barbara Maritime Museum. Great fun for people of all ages. Go whale watching. Check out Yelp reviews for whale watching here. Charter your own boat. We like Green Flash Charters. Good people and a fine boat. Rent a sailboat or jet ski. Go stand-up paddle boarding or kayaking in the harbor. Walk to the end of Stearns Wharf. Buy a boat from Chandlery Yacht Sales! 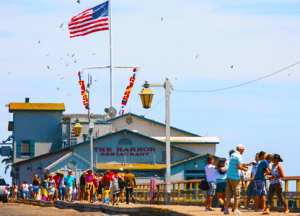 Whether you’re in the mood for a simple salad or burger for lunch, a sizzling surf & turf feast for dinner or a double-scoop ice cream cone for an afternoon snack, the Santa Barbara harbor, and Stearns Wharf have got you covered. Start your day with a mouth-watering breakfast at Breakwater Café. We’re partial to their classic Huevos Rancheros, but we have a 9-year-old who swears by their Pigs in a Blanket. Once fortified, take a leisurely stroll around the harbor. Start by walking out on the breakwater. If the tide is low, walk all the way out to Sand Spit to watch the many surfers, kayakers, and beach-goers. If you’d rather work off that breakfast in a more rigorous manner, rent a stand-up paddleboard from Paddle Sports Center and paddle your way around the harbor. Tell everyone, “Hey! There’s my boat!” when you find the one you like. After a quick burger or spicy pork taco from On The Alley, take the kids to the Santa Barbara Maritime Museum and learn all about local maritime history. Many of the exhibits are interactive, so be sure to ask the front desk about the kid scavenger hunt. Don’t forget to visit the gift shop on your way out. You’ll need a little pick-me-up at this point, so head over to Stearns Wharf, the oldest working wooden pier in California. 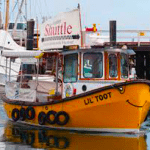 Little Toot water taxi is a fun way to travel from the harbor to the pier and back. We like to get an ice cream cone at Great Pacific. While there, take a stroll to the end of the pier. See if anyone’s caught anything today as they sit on the edge of the pier, dangling their baited fishing line over the side. Pick up a Santa Barbara t-shirt to commemorate your visit and peek into Sea Center to gawk at the giant whale hanging from its ceiling. Is it time for a nap? NO! More to see! More to do! But alas, we need a bit of downtime, so take the next hour to relax on East Beach, West Beach, or Ledbetter Beach. 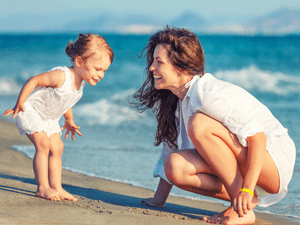 The kids will love it while mom and dad can chill for a bit before dinner. A day in the Santa Barbara harbor would not be complete without a visit to a local favorite, Brophy Brothers. They are famous for their signature bloody marys, but their food ain’t half bad either. Actually, it’s amazing. 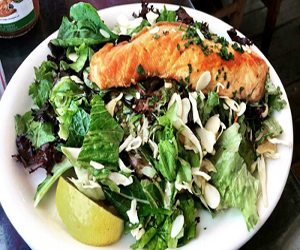 Fresh, local seafood is their specialty, but their salads and clam chowder are also crowd favorites. Come early and expect a wait. It’s that good. Need more ideas? Call Chandlery Yacht Sales at 805-965-4538. We’ve been around since 1946 and delight in sharing local knowledge. It’s our pleasure to help!